A Jamestown establishment and the legacy of its beloved late proprietor have prompted an act of kindness by NFL Commissioner Roger Goodell. For that, Mary McCusker, owner of The Pub on Main Street, is most thankful. The story has its origins when a package was delivered to The Pub three weeks ago, nearly a month after Mary’s husband Jim died at 78. Contained in the package was a Philadelphia Eagles No. 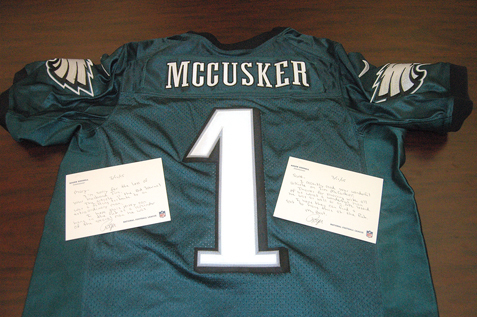 1 jersey with “McCusker” emblazoned on the back, in recognition of Jim’s seven years as an offensive lineman in the NFL, including four with the Eagles. The package was addressed to “Pat and Scott McCusker,” although there is no Pat or Scott in the McCusker family. After all, Smeraldo had spent months trying to procure an Eagles jersey from the team after a fire heavily damaged the bar in late 2013, but he said he hadn’t any communication with the NFL franchise since last summer. Mary also assumed “Scott” was yours truly, the author of a column that was published in The Post-Journal on Feb. 15, two days after Jim’s passing. In that piece, I suggested that a No. 1 Jamestown High School jersey – Jim was a first-team all-state player at his alma mater in the 1950s – be framed and hung at The Pub in recognition of how this community feels about its favorite son. Well, thanks to the cooperation of JHS football coach Tom Langworthy, the Jock Shop, Jim Walton of I’ve Been Framed and the Chautauqua Sports Hall of Fame, that is scheduled to happen later this week. But where does Goodell fit into all this? Well, when Mary pulled the Eagles’ jersey out of the box (the return address read National Football League, Office of the Commissioner) two cards fell out – one for her and one for me. An email to Goodell’s office Monday morning seeking comment wasn’t immediately returned, but it’s clear that the framed No. 1 JHS jersey will soon have company on the walls of one of Jamestown’s favorite establishments. Their connection was made possible because Goodell, one of the most powerful men in sports, took the time to remember one of our own towering giants in a meaningful way. One Jamestown native to another.